ABU DHABI (Reuters) - Dutch coach Bert van Marwijk says getting the United Arab Emirates to the World Cup finals for only the second time in 2022 will be the sole focus of his time in charge of the team. "I'm only here for one thing and that's to qualify for the World Cup," he told reporters in Abu Dhabi after signing a three-year deal with the option of another two years. "It takes a long time and the first thing we have to deal with is the first qualification round and that's why I'm here." "I'm looking forward to having this job," he said. "I know the Emirates, I know the team because with the Saudis we played four times against each other, so I know the strengths also. "I heard there were some young talents so I'm anxious to know how good they are." Chief among those talents is playmaker and former Asian Player of the Year Omar Abdulrahman, who missed the UAE's surprise run to the semi-finals of the Asian Cup in January because of injury. They were thrashed by neighbours and eventual champions Qatar in that semi-final with Zaccheroni departing immediately after the match. 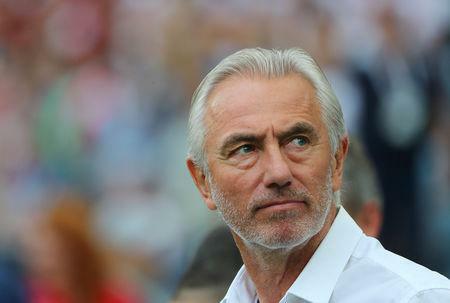 Van Marwijk took the Dutch to the World Cup final in 2010 but more importantly for the Emiratis, also led Saudi Arabia to qualification for last year's finals, their first trip to soccer's showpiece event since 2006. Part of his falling out with the Saudis before the last World Cup was their insistence that he live in the country, something he was again not prepared to commit to with the UAE. "I was also the coach of Holland and I will do exactly the same as I did there," Van Marwijk said. "I will be here when I'm needed to be here."